This five-piece limited series honors Ferdinand Berthoud, one of the forefathers of the marine chronometer. Named for two French ships with Berthoud’s masterpieces aboard that vanished in 1785 during an ill-fated expedition to circumnavigate the globe, this bronze watch pays tribute to the lost pieces. The octagon-shaped cases have an aged patina, each representing a different stage of oxidation, perhaps showing what the chronometers would look like if they were discovered and pulled from the ocean’s depths. The rough-hewn look of the watch is a great contrast to the incredible high-horology movement, caliber FB-T.FC.R, inside. The in-house manual-winding movement consists of a tourbillon and a fusée-and-chain chronometer. It is visible via two portholes on the case side, as well as through the sapphire caseback. The German silver dial features a regulatorstyle display with hours depicted via a disc at 2 o’clock and minutes at 12 o’clock. 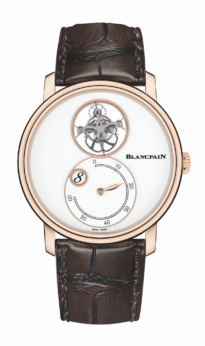 The movement, with 53 hours of power reserve, is chronometer certified.